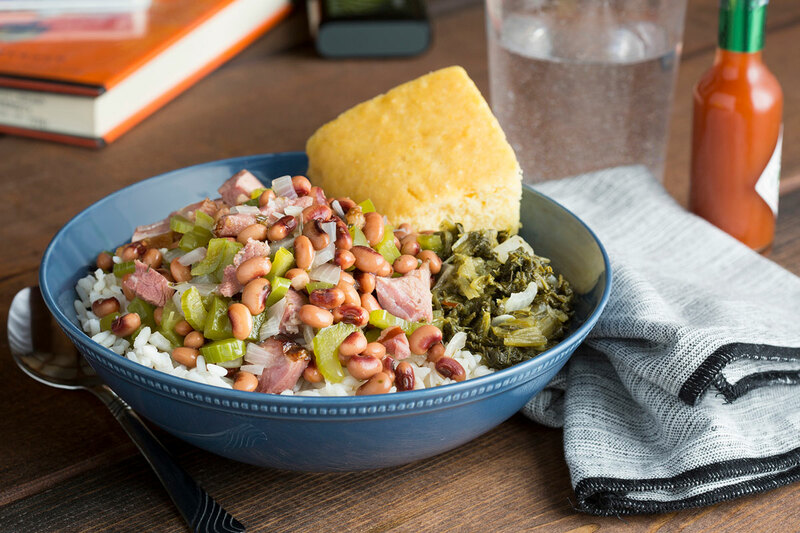 Serve this classic New Year’s Day dish with hot cooked rice, greens and cornbread. Melt butter in a large saucepan. Add onion, bell pepper, celery, garlic, oregano, thyme and cayenne. Cook 3 to 5 minutes, stirring occasionally, until softened. Add water and ham hocks. Bring to a boil over high heat. Reduce heat to low and simmer, covered, 10 minutes. Stir in black eyed peas and simmer, covered, 5 minutes. Remove ham hocks; dice the meat and return to saucepan. Serve over rice with greens and cornbread. Short-cut Hoppin’ John - Omit water and ham hock in Step 2. Instead, add 1 can (14.5 oz.) reduced sodium chicken broth and 1 cup diced ham or 8 cooked and crumbled bacon strips with the black eyed peas. Bring to a boil. Reduce heat to low and simmer, covered, 5 minutes. For a saucier dish, add additional water or chicken broth in Step 2.